If You're shopping for mens shoes that have that 1920s style from the days of Prohibition, Stacy Adams Shoes is the brand that will certainly take You Back in Time. Stacy Adams shoes are made of only the finest lambskin leather uppers combined with with leather linings for comfort with classic style looks. Once you put on a pair of Stacy Adams shoes people will ask you if your shoes are Stacy Adams. 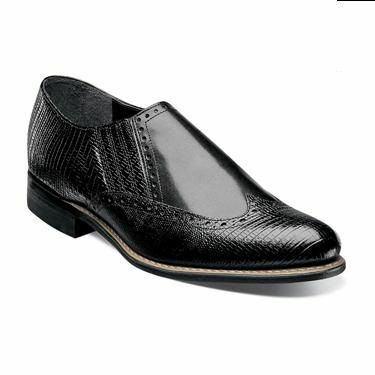 The Dayton shoe by Stacy Adams features both smooth black lambskin leather and lizard print leather trim. Learn more about Stacy Adams Here. .